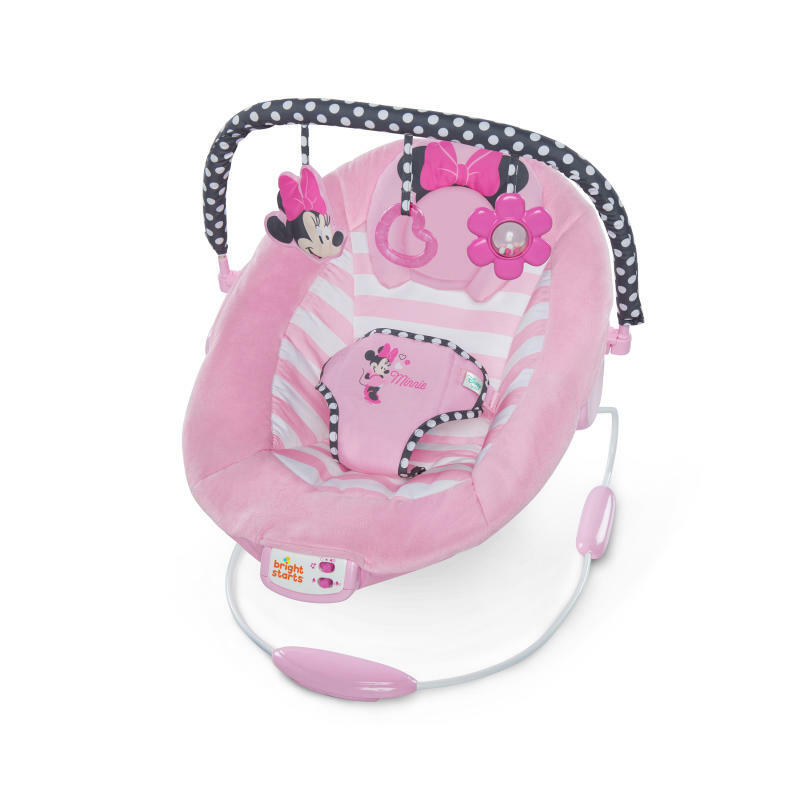 Your little Minnie Mouse will love playtime in the Disney Baby™ MINNIE MOUSE Blushing Bows Bouncer™ from Bright Starts™. Cradle baby in the comfort of the plush cradling seat designed with super soft fabrics. Support younger babies with the adorable head support cushion adorned with, what else... Minnie Mouse Ears and bow! Add a few extra hands-free moments in the day by entertaining baby with 7 melodies and soothing vibration that auto-shut off after 15 minutes. The removable toy bar lifts out easily with one hand and keeps little ones busy with 3 Minnie-approved toys. Baby can engage with a pink daisy rattle, heart-shaped toy, and a plush Minnie. When things get a little messy, simply toss the seat pad in the washing machine. A 3-point harness and slip-resistant feet keep baby secure. Complete your Disney Baby™ Minnie Mouse Blushing Bows™ collection with the Playard and Swing (each sold separately)!